BUYHIBS have called on the Hibernian board to announce details of their plan for the club’s future before next month’s annual general meeting, rather than presenting it then as a fait accompli. With Sir Tom Farmer and Rod Petrie owning the vast majority of the shares and therefore sure to have their wishes carried out at the meeting, the campaign group is concerned that supporters will be given no chance to make up their minds about any proposed changes. Hibs chief executive Leeann Dempster said last week that the AGM would be held on 28 January – later than usual – to allow talks between the club, its owners and its bankers “to be concluded”. BuyHibs, along with another fans’ group, Hands On Hibs, is particularly worried by continued speculation that the football club will be separated from Easter Road and East Mains, and that the club will in future be charged rent to use the ground and the training ground. “There’s a lack of transparency,” Neil Wheelan of BuyHibs said yesterday. “We’d always been told that the board would put proposals to the fans at the AGM, but the wording in their latest press release was very different. They said that the AGM had been delayed to allow the deal to be concluded. “In my view, a proposal isn’t a done deal. I would like as much transparency as possible – there are obviously some financial details that they probably don’t want in the public domain, which is fair enough. “What structure do they see in future? Is everything retained by the football club? There has been a lot of conjecture that the club will be put into the ownership of a trust. Can that be clarified? Hibs have had discussions with their bankers about a reduction of their debt, and it has been suggested that the placing of the ground and training ground in a trust has formed a large part of the negotiations. Wheelan believes it is vital the club and its assets stay together. “It’s probably something that concerns all Hibs supporters,” he said. “We’ve said from day one that we want everything kept together. “The fans have already paid for the ground – the fans are the only people besides the sponsors who invest in the football club. So the Hibs supporters have paid for these assets through season-ticket money, merchandise and so on. “We’ve paid for it. We now might lose it and get asked to rent it. Why should we start to pay for it again? BuyHibs’ request to meet Farmer and Petrie has yet to be granted, with the club having invited them to meet the board of directors instead. 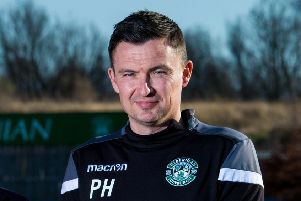 Wheelan believes that, in any case, until Hibs clarify their plans, both his own organisation and any other potential purchasers of the club, including England-based businessman Richard Skellett, can do little more than wait. “I’ve spoken to a number of possible buyers,” he said. “Their view is that, until they can get a price, it’s very difficult for them to stick their head out and name the sum they’re willing to put in. “If everything is separated, and the football club is what’s available to purchase, how much would you pay for a Scottish Championship football club with no assets? We need the detail. We need transparency from the owners. What are they planning? “Richard is the only name that keeps getting mentioned, apart from David Low, and I think his bid has been ruled a non-starter by the club. I don’t speak much to Richard, but the last time we spoke I got the impression there was certainly no deal on the table from his end. Furthermore, until Hibs’ plans are revealed, Wheelan is not sure that Farmer really wants to sell up. If the current owner does decide to negotiate in earnest, Wheelan will suggest that he has no moral right to be recompensed in full for the debt the club owes him. “I would rather not pay him. It’s his management team that have built the debt up. He’s sat on the sidelines and let this board of directors – I’ll exclude Leeann Dempster and George Craig as they’ve not been there for long – run up the debt and mismanage the club.